NaNoWriMo: Week 2 Write-Ins & Workshops | What's On My Nightstand? 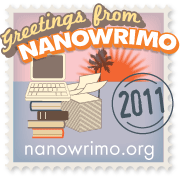 It’s the second week of NaNoWriMo*. It’s not too late to join the fun with the RaiderWriMos here at Oakton. All our Write-Ins and Write-Ins/Workshops are held in Oakton Community College’s Library Classroom, Room 2418 at the Des Plaines Campus. Week 2 Write-In/Workshop: What the Heck Was I Thinking?! thrive, nay, you will thrive, so stick with us!